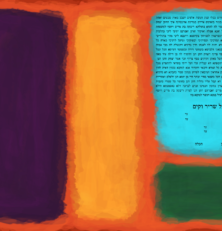 This Is Not a Ketubah, Yes it is! (also known as, “TINAK”) is a collective based in New York and Buenos Aires which calls on the talents of up-and-coming Jewish artists. Unlike any Ketubot we’ve seen before, they didn’t just say they were modern, but the designs actually were modern! Calling on such ‘masters’ like Chagall, Rothko, and Gaudi, This Is Not a Ketubah’s team of artists produce gorgeous modern prints in several size. It seems that every time we visit the site, another design has appeared. They don’t boast more than about 60 designs, but each one seems more exciting than almost anything else we’ve seen! Even though we’re both Jewish, the Interfaith text seemed especially touching. It’s nice to see that it isn’t just another option on the list, but a meaningful option for all types of couples! If you’re looking for a completely personal touch to a Ketubah, they also offer “Commissioned Ketubot” which allows couples to work with the collective to create a unique design that will be theirs forever. It might be a bit on the pricey side ($875), but it just might be the one thing from your Wedding Day you want to hang on the wall forever!